Här i våra hemmaknutar ser vi regelbundet oregelbundet en liten citykanin, men den är säkert mer destruktiv i det gröna än sin Bugaboo-kusin. Jag deltar i: Clear it out (In the Garden + Ribbon), Craft your Passion (Ribbon), Catch the Bug (Color Challenge), Passion for Promarker (Things with Wings), I love Promarkers (AG), Crafting for all Seasons (Whatever the weather - and at least righ now it's lovely summers day) och Pile it on (Outdoors fun). A fabulous card. Thanks for joining this weeks challenge at Passion for Promarkers. 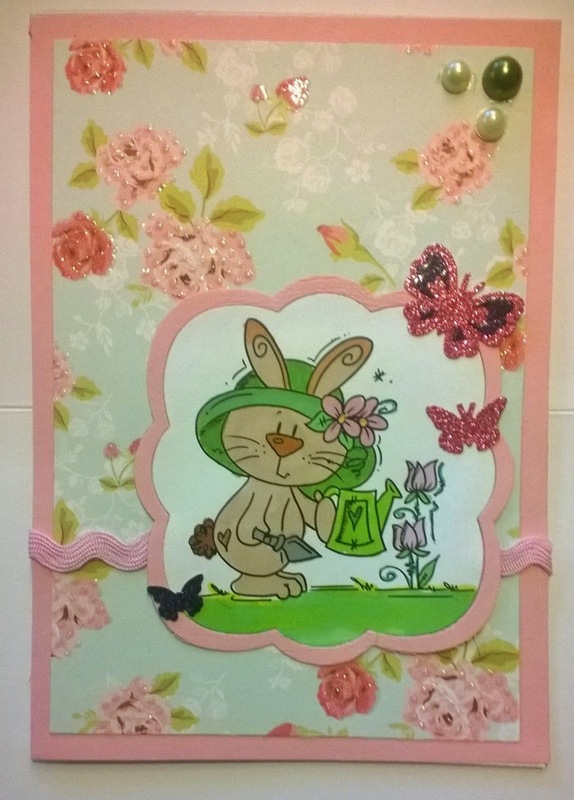 I just love those little bunnies from Bugaboo,.,Great card. Thanks so much for joining us at Catch the Bug this week, hope to see you again soon! What a great project, very cute!! Thanks so much for joining us for our June Color Challenge at Catch the Bug! Don’t forget to check out The Bug Blog for our new Challenge that starts tomorrow! How adorable - I love the sparkly butterflies! Thanks so much for entering our colour challenge at Bugaboo's Catch the Bug blog - good luck in the draw. Please join us again soon. Thank you for playing along with us this week for the The Bug Color Challenge with Bugaboo Stamps! Don’t forget to check out The Bug Blog for our new Challenge that starts today! We hope you’ll join the fun!!! Thanks so much for participating in our "Whatever the Weather" challenge at Crafting for All Seasons!! Hope to see you again for our next challenge!! This is adorable. What a cute image. Thanks for joining us at Passion For Promarkers this week.